The newspaper was correct in its prophecy. Five months later, on August 12, 1916, The Real Estate Record & Builders’ Guide reported that Delano & Aldrich had submitted plans for a five-story “brick and limestone residence” that would cost “in the neighborhood of $200,000.” Before November Pierson & Goodrich signed the contract to supply the 125 tons of steel it would require to construct the framing for the lavish mansion. Delano & Aldrich produced an imposing neo-Georgian mansion clad in limestone. By setting one bay back beyond the entrance door, the architects created the illusion of a free-standing structure as well as providing additional light and ventilation to the spaces inside. The family moved into the mansion from their home at No. 9 East 56th Street around the time James Woodward died, leaving William major holdings in the Hanover National Bank as well as the entire Belair Stud Stable—one of the country’s major racing stables. In addition, the Woodwards maintained a summer estate in Newport, “The Cloisters.” It was in Newport during the next war-torn years that Elsie would tutor servicemen at Fort Adams in French. She realized the language would be helpful to them when they were shipped abroad. Elsie Woodward earned a reputation as a refined, elegant hostess and her entertainments often centered around music and lectures. During the winter season of 1921 she hosted a series of lecture-musicales; during one of which, held at 4:00 on the afternoon of December 8, conductor H. A. Fricker spoke on the “Choral Music of Great Britain and Canada,” accompanied with selections by the Schola Cantorum. On February 8, 1923 W. J. Henderson spoke on “What Is Good Singing?,” “with vocal illustrations,” reported the New-York Tribune. On February 2, 1928 the house was decorated for the wedding reception of daughter Elizabeth. She married Robert Livingston Stevens in St. Thomas Church that afternoon. The event was replicated a year later when Edith married Thomas Moore Bancroft, also in St. Thomas. While the Woodward girls were being married in the fashionable Episcopal church on Fifth Avenue, the gargantuan Cathedral of St. John the Divine was slowly rising far to the north. In November 1931 it was announced that William Woodward had donated the 40-foot diameter Great West Rose Window—a gift costing $80,000. The window would be larger than the rose windows of Notre Dame in Paris and the Cathedral of Rheims. Elsie C. Woodward’s interests and activities went beyond musicals and lectures. During the Prohibition years she was vice chairman of the Women’s Organization for National Prohibition Reform. Called by The New York Times “Women Wets,” the county chairpersons met in the Woodward mansion to discuss lectures “on repeal legislation” in December 1932. Society was somewhat shocked when on April 8, 1941 the Woodward’s daughter Ethel married Philippe de Croisset in the Roman Catholic Church of St. Ignatius Loyola on Park Avenue. “No announcement of the engagement had been made, and the wedding comes as a surprise to many members of society,” reported The Times. The groom had arrived in New York a few months earlier after the evacuation of Dunkirk where he had served with the British forces. His family was one of the oldest of the French nobility and during the peace negotiations of World War I President Woodrow Wilson used the de Croisset Paris house as his official residence. By the time a baby boy was born to the newlyweds in 1943, they were living in the 86th Street mansion with Ethel’s parents. There would be one more wedding reception held in the Woodward house. On October 18, 1952 the Woodward’s granddaughter, Mary Ann Stevens, married Ferris Fleming Hamilton, Jr. The wedding guests arrived No. East 86th Street afterward for what would be one of the last festive entertainments here. The following year William Woodward died. Elsie stayed on until 1956 when she moved to what The New York Times described as “a sprawling six-room apartment in the Waldorf Towers, with a staff of two—a maid, and a butler.” The servants had been with the family for decades. The offset entrance provides private outdoor space above. Meanwhile, in 1959 the mansion was converted to a private club. That year the Loyaltown Ladies League called it home. But it would soon become The Town Club of New York, a swank private club and the scene of a homicide on November 17, 1964. 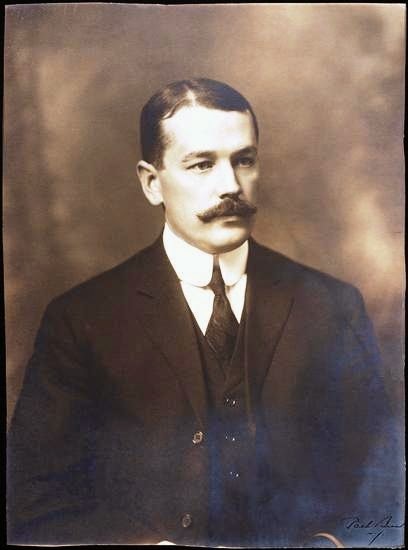 Twenty-nine year old Joseph Ernest was hired as a steward in the club six weeks earlier. That evening he was drinking in an East Side bar with 36-year old Norman Berg. When the bar closed, Ernest invited Berg to come to the posh club where he worked. Around 4:30 they went to the manager’s office on the top floor. The notorious incident was an isolated blemish on the otherwise discreet and dignified club. It would operated here until 2004 when the owners sold the building to hedge fund manager John Paulson for a reported $14.7 million. Paulson commissioned Janko Rasic Architects to restore the mansion to a single-family home for what has been estimated to be about another $5 million. 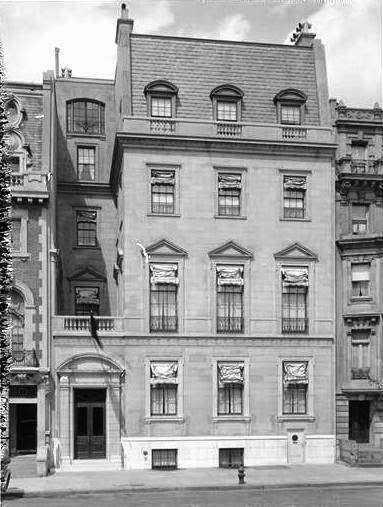 The Woodward mansion is today one of Manhattan's most opulent private homes. Continuing the tradition begun by the Woodwards, the current family also maintains homes in Southampton and Aspen, Colorado. And, of course, the Woodward's son, William, Jr. married showgirl Ann Crowell who would later shoot him to death, claiming that she had mistaken him for a burglar. When you usually post a photo of a townhouse like this, it is difficult to appreciate the scale and dimensions when pictured with other like structures, however this beuaty is squeezed in by 2 non-descript apartment houses with probably equally dull apartments with standard 8 foot ceiling heights. Their unfortunate presence on the street makes the Woodward townhouse seem preposterously gigantic. The Woodwards seemed to have more than their fair share of tragedy. It's the big release day for Tom's book! I got a notice my pre-ordered copy has SHIPPED !!! Wahooo . Thanks for noticing today's my lease day! Two years waiting!!! I love passing by this house. It exudes elegance and charm. Surrounded by tall buildings, this sort of stands out and even has sort of a petit palacio feeling. It's quite a gem. who adopted this noble name. He wrote the play made into the film, A Woman's Face, 1938 with Igrid Bergmasn and 1941 with Joan Crawford. Charles Wiener de Croisset is the son of this marriage.